Final issues of miniseries’ are the hardest to review, as I don’t want to spoil anything major for readers who may be coming across this review before deciding to buy the book themselves. But then again if I liked the miniseries (and if I’ve made it to the final issue and am still reviewing it, you can bet that I liked it at least a little bit), then I do want to give enough info that new readers will be encouraged to pick it up. It is quite a conundrum. Well, allow me to say that, in my opinion, this miniseries ended more than satisfactorily. And while I won’t give away the actual ending, I’ll say that my earlier guess that this entire adventure could turn out to be just dream is, thankfully, not the case. But what does happen is that the alien invasion is defeated, thanks in large part to Joey’s creativity, as he comes up with a way to help Mighty Mouse, the local police and the National Guard turn the tide against them. And Mighty Mouse indeed returns to his own “cartoon universe,” but things are left open to suggest that the story of him and Joey is not quite over. Writer Sholly Fisch knows how to craft an intelligent tale with lots of action that keeps the reader in suspense. It’s particularly impressive in the way he shows “real people” reacting to all of the absurdity of this situation, without getting too distracted by it. And with all that action, there’s also a moral message in story, it’s about standing up to bullies, without ever feeling preachy about it. This is, first and foremost, a superhero book, and I enjoyed it immensely. And Fisch was ably backed by an excellent artist. Igor Lima’s style fit the tone of this series perfectly, and on this issue he was backed by colorist “Mohan,” who helped make his artwork standout. 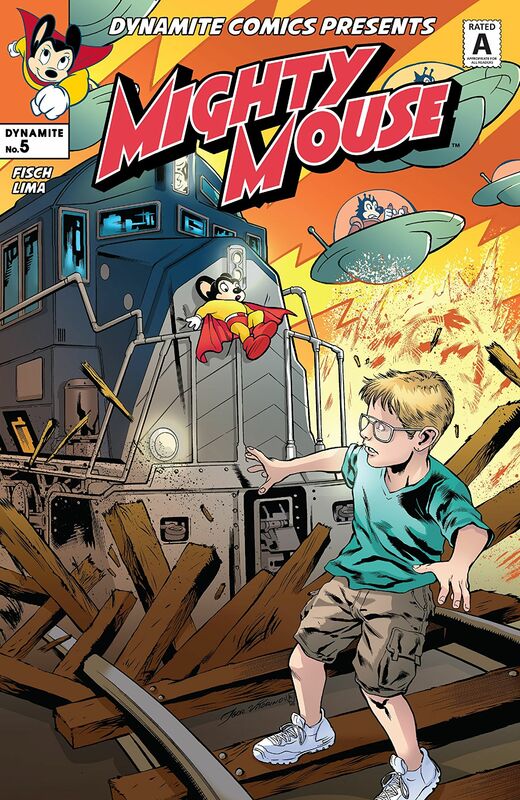 Whether you were ever a fan of Mighty Mouse or not, I highly recommend checkout this miniseries.